Intense competition among players is the key characteristic of the business landscape of the Asia Pacific controlled release fertilizers market. The top two players, namely, Kingenta Ecological Engineering and Shandong Shikefeng Chemical, collectively held nearly 50% of this market in 2014, demonstrating a moderately consolidated market structure, finds Transparency Market Research (TMR). Fertilizer manufacturers in Asia Pacific are making use of advanced technologies and economies of scale to produce low-cost specialty fertilizers, of which controlled release fertilizer is one of the fastest-growing segment. In the near future, these companies will be focusing on increasing their production capacities and constructing new business facilities in emerging markets to expand their reach. The population in Asia Pacific has been reporting an exponential rise since the last few years. According to the United Nations Economic and Social Commission for Asia Pacific (UN ESCAP), the region is home to more than 4.4 billion people, accounting for almost 60% of the world’s population. With this robust population base, the need for food is growing unprecedentedly in this region. On top of it, the need for shelter is also increasing extensively, leading to the dwindling of arable land. Hence, farmers are increasingly using controlled release fertilizers to enhance their agricultural output from the limited available land. Besides this, agriculturalists in Asia Pacific are focusing on upgrading their farming methods to boost their crop yield in order to meet the growing demand for food. As controlled release fertilizers possess eco-friendly properties and are more efficient than conventional fertilizers, their application will be increased significantly in this region over the forecast period. The Asia Pacific controlled release fertilizers market is likely to expand at a CAGR of 7.20% during the period from 2015 to 2023, estimates TMR. The market’s opportunity will rise from US$1.1 bn in 2014 to US$2.1 bn by the end of the forecast period. 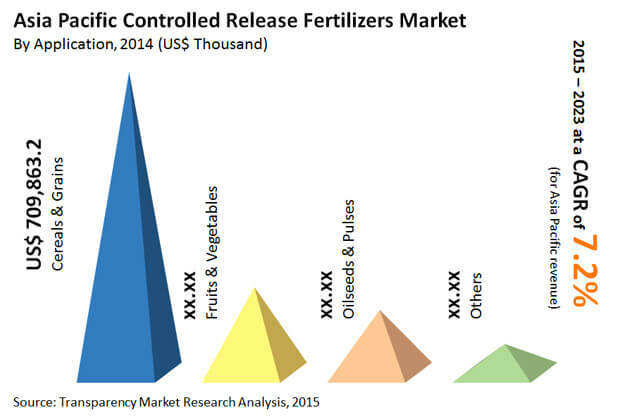 China and India are the most attractive markets for controlled release fertilizers in Asia Pacific. In 2014, China emerged as the dominant consumer of these fertilizers, holding a share of over 75% in terms of volume. Other regional markets exhibit moderate attractiveness due to the low adoption of these fertilizers in the agriculture and horticulture sectors. Most of the demand for these fertilizers arises from cereals and grain crops. Analysts expect this demand to increase substantially over the forecast period. Sulfur coated urea or polymer sulfur coated urea is the highest consumed controlled release fertilizer in Asia Pacific. This segment contributed a share of over 45% of the total consumption of these fertilizers in 2014.